Many people these days are using products to give themselves longer, fuller eyelashes. Call them what you will—eyelash lengtheners, eyelash enhancers, false eyelashes—they make up a major part of the cosmetics industry, and for good reason. After all, your eyes are one of the first things that a new person notices when looking at your face. Of course, even the best eyelash enhancer won’t do you much good if it doesn’t stay in place. That’s where eyelash glue comes in. If you’ve got a good product and apply it correctly, your eyelash glue will provide you with hours of safe, comfortable staying power to keep you looking your best. Here’s how you can find the best brand for your needs. Brush-on: These glues use a brush to apply the glue to your natural eyelashes, after which you stick on the enhancer. 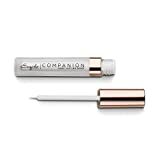 Squeeze-on: These brands avoid the brush by having you apply a thin layer of glue to the area of your eyelashes, which then allows you to put on the enhancer. It might take a bit of practice, but many users say that it doesn’t take long to get the hang of things. Setting length and strength: These are the two most important qualities for eyelash glues; there’s no point in purchasing a glue that will only hold for an hour or two. The best brands set quickly and keep the enhancer in place all day long. Eye irritation: This has the biggest potential to be a deal-breaker—no matter how effective a glue is at holding the enhancer in place, it won’t do any good if it comes at the cost of irritating the user’s eyes—or worse. Fortunately, quality glues are made from materials that are safe to use and won’t cause such issues. Residue: With some brands, residue can be a problem—it defeats the purpose of using an eyelash enhancer if the glue that holds it in place leaves a telltale smudge. Better brands don’t have this problem, going on clean and staying in place. Ease of removal: At the end of the day, it’s important that the glue be easy and comfortable to remove, which is a feature of the best glues. Active ingredient: Even though most eyelash glues are perfectly safe to use, there may be brands that could cause you problems. Before purchasing a new glue, be sure to check out the active ingredients and be on the lookout for ones that you know might cause skin irritation for you in particular. 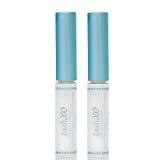 Tone: Eyelash glues generally come in two tones: clear (with the idea that they’ll go on and be difficult to detect) and dark (to match the color of the eyelash enhancement). If you have a have a particular look in mind, look for a brand that will work with it. Waterproofing: This is a pretty standard feature for eyelash glues—for obvious reasons—but not all brands have the same level of waterproofing protection. If you know that this is something that will be important for you, be sure to check out the reviews to see just how secure the glue is when things get a bit wet. Duo: Duo has been a leading producer of eyelash adhesives for over sixty years. The company’s products have long been popular with costumers, makeup professionals, and everyday consumers who are just looking for an excellent product. Darkness: Darkness specializes in eyelash enhancement, offering a variety of eyelash enhancers and glues to meet users’ needs. Ardell: Ardell is an American company that has been producing high-quality eyelash makeup and enhancers for decades. Founded in 1971, today the company is recognized as an industry leader. Kiss: Kiss is an American cosmetics manufacturer. The company makes a wide range of products, including eyelash enhancers, artificial fingernails, and an array of makeups. Blink: Blink is a company that specializes in eyelash enhancement. They offer a range of false eyelashes, glues, and other products.